I had a whole bunch of projects lined up but it’s difficult to start anything big because I’ve been sick and flu-y for about 2 weeks now (and I still feel like junk). Sewing was the only “easy” project that I can work on since I can do it while reclined and under a blanket :-). I started with a square pillow and moved on to other shapes. I get the mechanics of patterns and such, but do not know how to use a sewing machine to put them together so everything was sewn by hand. It took forever and I poked myself a few times. At least I didn’t draw blood! Emboldened by my success with the various shaped pillows (since they were so super hard to do ;-)), I decided to make a pair of slacks for Dakota, my Fairyland (PukiPuki PongPong) Ball Jointed Doll. 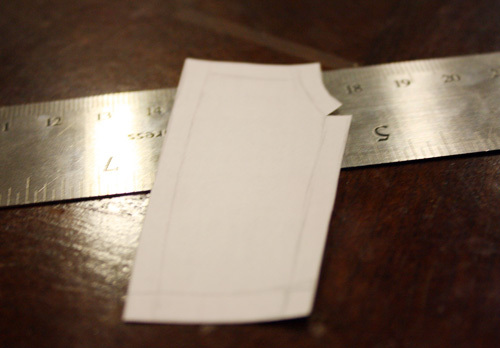 The pic above is a simple pant leg pattern I sketched up after Googling 1:1 scale patterns. 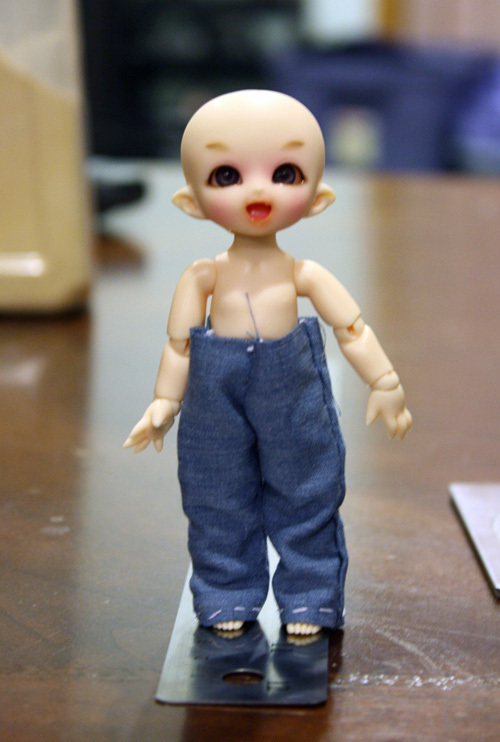 It took about 2 hours to put together, but… look how happy he is to finally be clothed! I think its a decent job for my first attempt at an actual piece of (tiny) clothing, though its obviously too loose on him. I’ll be converting it to overalls because I don’t want to deal with putting in an elastic band on such a tiny piece (like I know how!). I may ask my mom to teach me how to use a sewing machine and to sew in general (she was a seamstress when she was my age). I really can’t imagine sewing such teeny things with a “normal” sewing machine. Do they have a machine specifically made for miniature making? (like the smaller table saws and such?) Or am I just being naive? 8 Responses to Adventures in Mini Sewing! Mini sewing is a lot of fun (exept that part when it is a hard work :^-) I sew for my vintage German doll, representing a 5-6 year old, so it is only 8 cm high, and clothes are so tiny-tiny-tiny…. Talking about putting an elastic band – it is not so hard as it seems. There is such tiny elastic cord, only few milimetres in diameter (you can find them in any sewing supplies shop). Take the smallest safety pin and put the elastic with the pin. I think the elastic band I was using was too big. I may have to visit the sewing shop soon! Good job for your first time. Using a sewing machine will cut down on your time, unless you are a speedy hand sewer. 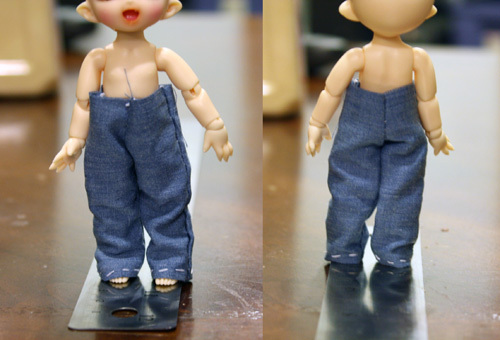 I’ve been sewing doll clothes for years. No special machine is needed…just a lot of patience initially. 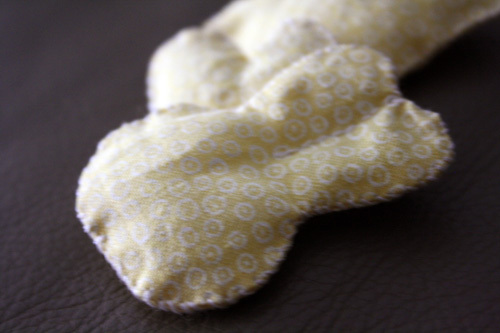 My latest challenge, sewing for an infant doll that is only 1.5in. Good luck. Get better. I find hand sewing very therapeutic (minus the occasional poking of my fingers). I just saw your post on the infant doll outfit. YIKES… its tiny! But it looks great! I think I am going to pass on the sewing machine for now (since I don’t have one and am too broke to buy one) and just stick with hand sewing. Its not such a big deal because I plan on sewing mostly small outfits (no longer than 50mm) so it’s not that much hand sewing. Also, I totally agree with you. 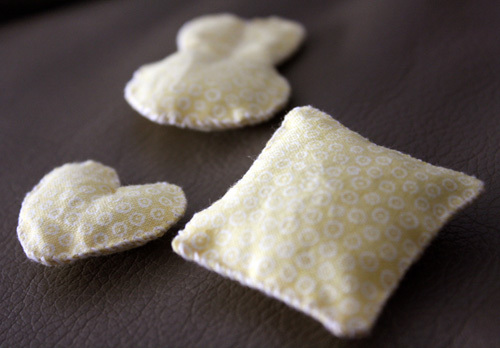 Hand-sewing is very relaxing and therapeutic! I am enjoying it so far! How did I miss this post? I like hand sewing, too. I plan on making clothes whenever I can get a hold of a Heidi Ott doll. 🙂 Love your little pants and doll though! He is adorable. I haven’t hand sewn in a few weeks. I kind of miss it even though I only did a bit of it! I was thinking about getting a Heidi Ott Doll, but I figured I’d save for an ABJD since I’m a big anime geek too and they’re right up my alley!